We leave in five days. Five days of finishing up chores around the house, being with my wife, playing with the dogs, frantically trying to get ahead at work so my teammates aren’t buried…and packing. Packing for an adventure is an art form. 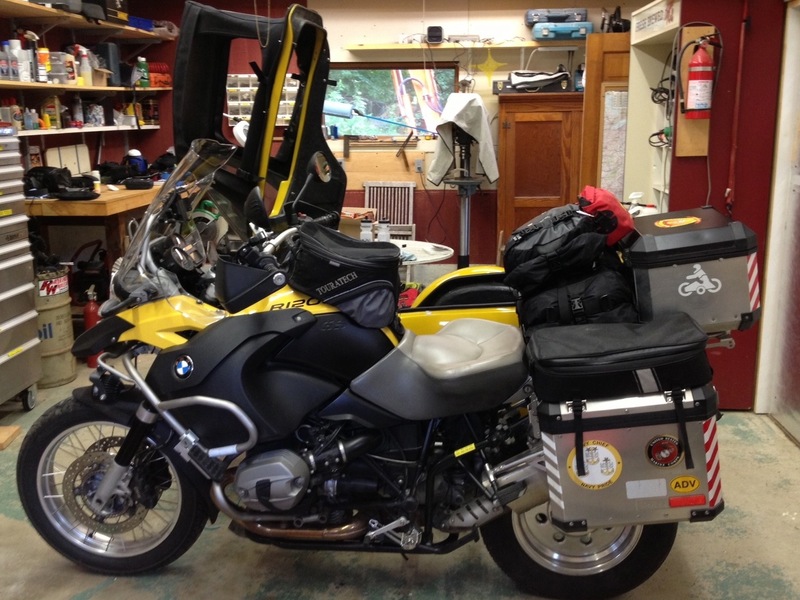 Last year I thought I had it all figured out, then I discovered Kriega bags. I had been happy with my Motofizz bag, except that it wasn’t waterproof. And when you are exposed to torrential rains as we have been (the eight inches that fell in three hours in Ontario when we had no place to hide comes to mind) that becomes a pretty significant exception. I’m extremely impressed with the quality and versatility of these new bags. But they forced me to reconfigure my packing scheme. Not that it’s a bad thing. I like the weight distribution much better now, and the fact that nothing light and easily picked up is anywhere near Barley’s memory foam mattress. You may remember that he is somewhat protective of his turf, and has a history of picking up and heaving over the side anything – no matter how critically important – that falls upon his sovereign territory. I like these Kriega bags! In the Touratech tankbag are small incidentals that I need to reach in a hurry: change for toll booths, a cheap point and shoot camera, chapstick, eyeglass cleaner and sunglasses. My left sidecase is full of clothing, the right food. 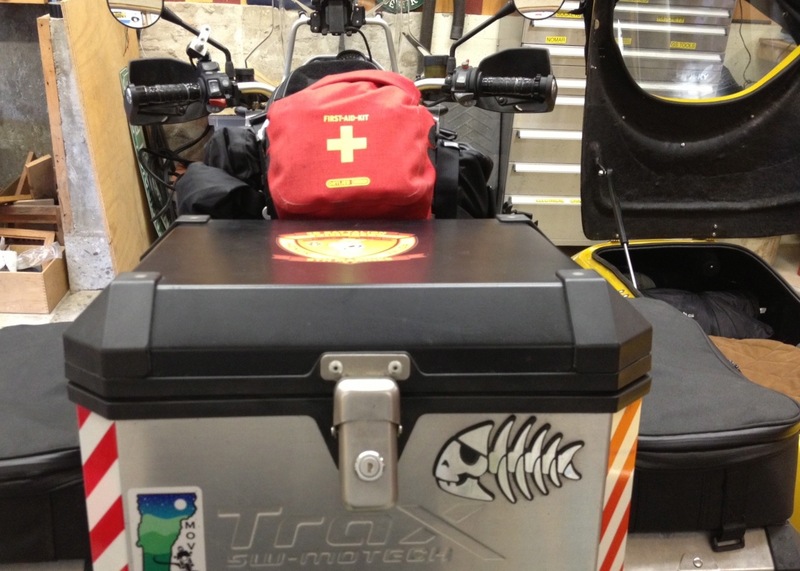 The left Wunderlich sidecase topper contains snacks, a flashlight, maps and owners manuals. The righthand sidecase topper contains dog stuff: treats, rabies certificate, veterinary meds, brushes and combs, and a tick key to remove any of those pests I find on my dog. The Kriega bags go right behind me in lieu of a passenger seat. On the bottom is a US 30 bag (30 liters) containing my Marmot summer-weight sleeping bag, Exped 7 insulated sleeping pad, military surplus poncho liner and a sleeping bag liner. In hot weather I’ll use one or both of the liners; in cold weather I’ll use them inside the sleeping bag. The smaller US 20 bag on top contains two compression bags. One contains hot weather gear and the other cold weather layers. The tiny red bag on top of the pile contains my emergency medical gear. I don’t take much. As a former Independent Duty Corpsman and a graduate of the Camp Lejeune School of Barbaric Medicine I’ve learned to do much with little. Inside the topcase is a small Igloo cooler, bulk supplies of eyeglass cleaner and poop bags, a magical concoction that softens dead bug carcasses and makes removing them from the windshield or helmet visor easier, a quart of engine oil, and a few microfiber towels. The cooler holds our lunch should it need to be kept cool. One of the best deals on the road is Subway. I’ll buy a foot long sub, share half with Barley at lunch and put the other half in the cooler for later. On truly hot days I’ll buy a five pound bag of ice in the morning, fill the cooler and all our water bottles with it, plus if it’s really insufferably hot I’ll stuff some in a ten liter water bladder which I place on Barley’s bed under a towel. When he gets uncomfortable he’ll lay on top of it and let it absorbs some of his excess body heat. By late morning when the heat really builds the ice in the cooler begins to melt. At every rest stop I’ll give Barley cool water (which he drinks more readily than warm) and dip a washcloth in the ice water to rub onto his belly. He enjoys that so much he’ll go belly up whenever he sees a washcloth in my hand. Electronics go in the locked trunk along with Barley’s backpack. Well, it’s actually my daypack but is filled with his stuff: treats, fresh water, water bowl, poop spade and bags, toys, another tick key, and a brush. Every time he gets out of the sidecar the pack goes with us so we are prepared for just about anything. In the nose of the sidecar is heavy stuff he can’t possibly pick up and give the old heave-ho: Our Nemo Losi three person three season tent, a sixteen foot Noah’s Tarp with sturdy poles, and my Kermit chair. I like the Nemo tent and chose the three person version because Barley runs in his dreams, and those claws raked my back more than a few times in a smaller tent. Nemo also offers paw liners for their tents, an insert that snaps in place to protect the tent floor from sharp claws. It’s a well built, roomy and airy tent that meets our needs very well. The tarp is for shade mostly, though I made the poles long enough that I can set up the tarp in a driving rain first, then set up the tent under the protection of the tarp. It’s not much fun camping when everything you own, including your dog, is wet.